The DJI Phantom 3 drone is one of the most popular camera-fitted drones on the market, offering a relatively affordable, easy-to-fly unit with outstanding picture quality. It’s a versatile machine that can turn any trip into a rewarding filming expedition. However, no matter whether you are a hobbyist or a professional film-maker, you will need to find a reliable means of protecting your DJI Phantom 3 during storage and transportation. Drones are sensitive pieces of equipment, and even small shocks or bumps can cause damage to the flying components – so we’ve checked out five of the best cases to keep your DJI Phantom 3 snug and secure between uses. Nanuk has a reputation for constructing strong, durable units, and this thick-shelled 945 case with a specially-cut foam interior for the DJI Phantom 3 drone is no exception. Made of impact-resistant Nk-7 Resinare to keep everything safely and securely closed when not in use, the case also features a ‘Power Claw’ latching system to ensure it doesn’t spring open when knocked around. Its rounded design and robust shell mean that you can stack cases on top of each other during transportation – a great plus on big projects, or in situations where you have to pack a lot of equipment into a small vehicle. Inside the case, the military-grade foam compartments neatly house your Phantom 3 drone and a wide variety of accessories. There is space for the drone itself, as well as four spare propellers, six spare batteries, the charger, and controller, as well as a removable polyurethane gimbal sleeve, designed to prevent your DJI from moving or shaking during transport. 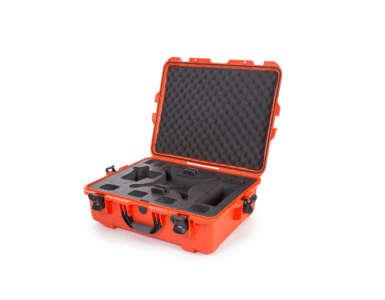 Some users complain that the case is not ideally designed for storing the drone unit with the propellers attached, so this might translate to a little more set up time when you arrive on site. The Nanuk 945 case, however, is waterproof and extremely weather-resistant, so it will suit those who need to film in wild outdoor terrain or in situations where equipment will be exposed to the elements for long periods of time. The Nanuk 945 DJI Phantom case comes in a range of attractive colors – black, olive, graphite, orange, yellow, silver – and is a solid, no-nonsense piece of equipment. Its superior protection means that the case is a bit on the heavy side of things, with some users complaining about the lack of rollers and a pull-up handle. However, you can buy an additional think-padded shoulder strap to alleviate some of the discomforts of carrying the case in one hand. A great all-around choice for DJI Phantom 3 users, and a must for those who intend on transporting their equipment long distances (rail, air, etc.) on a regular basis. Those looking for a good compromise between protection and value for money should check out the Depstech Potensic Protective Carrying Case for their DJI Phantom 3 drone. Built from lightweight reinforced aluminum, the case offers decent protection from shocks and bumps, while the shock-absorbent interior foam is specifically designed to dissipate force and keep your quadcopter safe during transportation. 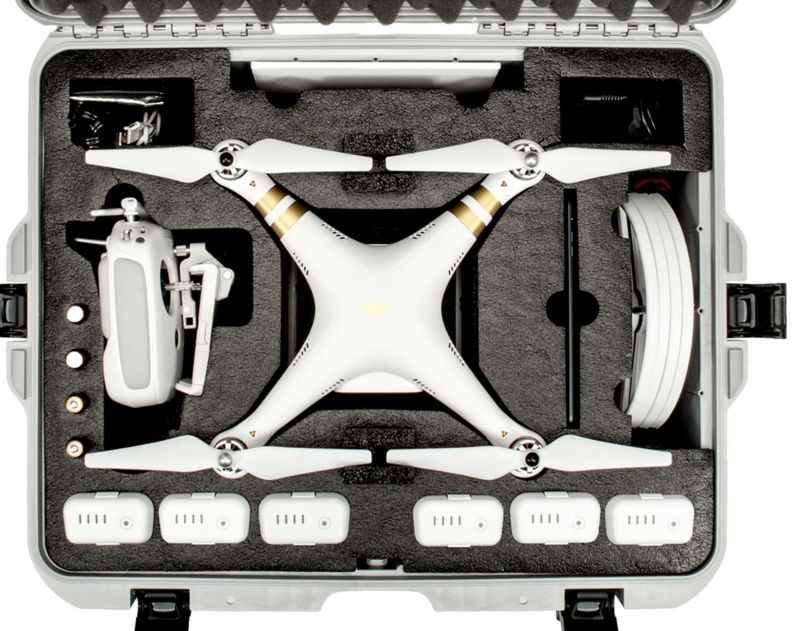 Inside, the pre-cut foam compartments offer a snug fit for the drone, the transmitter, controller, charger, spare batteries, and propellers – ensuring these accessories do not jostle around when the case is packed and moved. For users with more advanced setups, the lack of space for a tablet and other extra accessories might be a bit limiting. Those looking to store their DJI Phantom 3 with the propellers attached should proceed with caution, as users report varying degrees of success when doing this – as should users who intend to use their case in extreme weather conditions. While the Depstech Potensic Protective Carrying Case is weather-resistant, it will not protect your precious equipment in the event of submersion in water, and filming in the desert or at the beach might test its dustproof credentials. 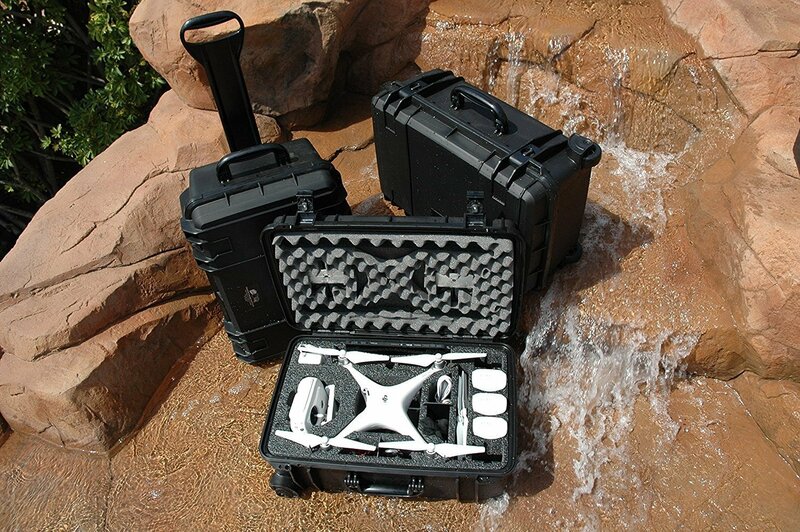 Although the Depstech Potensic Protective Carrying Case might not be enough for professional users – who need to transport their equipment via air, or who need to set up in particularly rough conditions – it is a perfectly serviceable, inexpensive option for hobbyists who will be carrying their drone around in their own vehicles. A premium mid-range choice, the Red Rock DJI Phantom 3 Carrying Case offers a stylish and durable case with excellent storage capacity. Featuring a sleek black finish with aluminum edges, the case continues this functional, professional design into its interior, where the pre-cut high-density foam compartments offer ample space for storing your quadcopter and necessary accessories. In addition to the drone unit, the case has space for a remote control, spare batteries and propellers, the charger, a small tablet (such an iPad mini) and – best news of all for serious users – the prop guard, as well. This means the drone can be safely stored (at least for short trips) with the propellers attached, translating to quicker set-up times on location, and less hassle when it comes to packing up at the end of the day. Measuring 23 X 14 X 9 inches, the case is large – but the extra bulk is worth it for the ability to keep everything in one place. The case is weather-resistant, but is not designed for extended use in rough conditions – and although it will easily cope with repeated trips in the back of a vehicle, some users have reported airline-related damage to the exterior when transported long distances. The ability to padlock the case would have been a great feature, as well, as the lock mechanisms might be suspect to tampering with by something like a screwdriver. 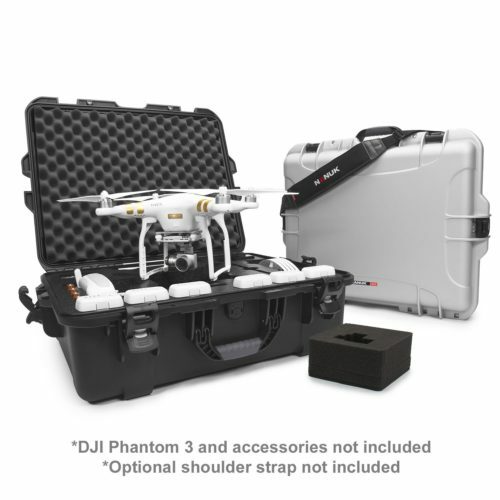 However, if these security concerns are not of great importance, the Red Rock DJI Phantom 3 Carrying Case is an excellent choice for those looking for a rugged, convenient, ‘all-in-one-place’ solution to storing their quadcopter and accessories. 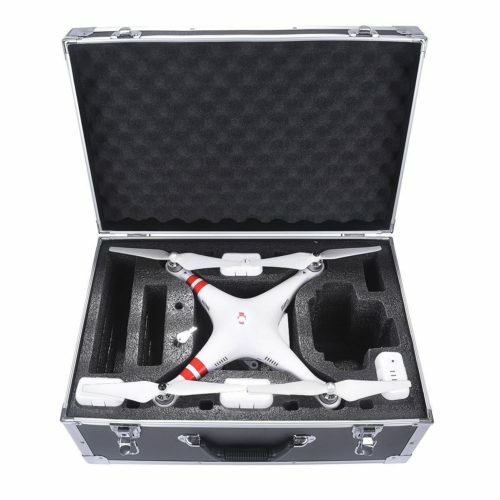 A similar case to the Red Rock option in terms of its look and price, the Atomik RC DJI Phantom 3 Drone Hard Box Carrying Case offers good durability and ample space for storing your quadcopter and its necessary accessories. Measuring 23.5 x 16.5 x 11.5 inches, it is slightly differently shaped than the Red Rock case but offers the same storage options: remote control, spare batteries and propellers, charger, a small tablet and the prop guard. 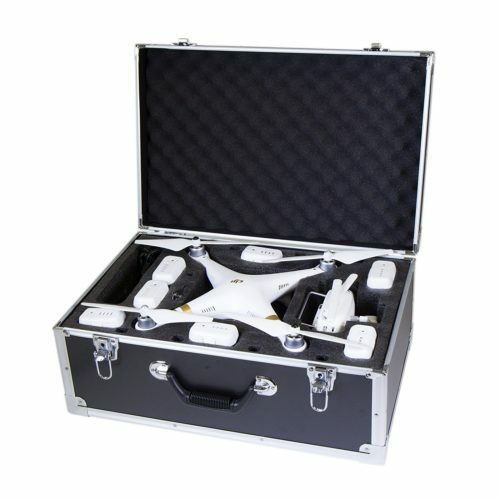 A slight disadvantage of the Atomik RC DJI Phantom 3 Drone Hard Box Carrying Case, though, is that the drone cannot be (safely) transported with the prop guards attached – a feature which might irritate users who like to have their quadcopters ‘set up and ready to go’ even during transportation. The case offers good weather protection and is light enough to be carried on short hikes, but a hardier case (such as the Nanuk 945) would be required for projects where your equipment would be exposed to the elements for prolonged periods of time. 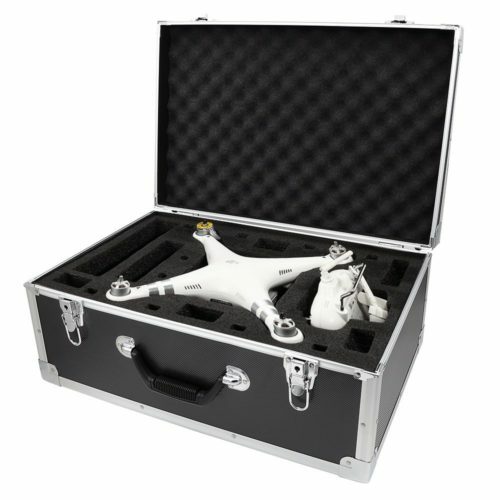 All in all, with its stylish matte black finish and high-quality pre-cut foam interior, the Atomik RC DJI Phantom 3 Drone Hard Box Carrying Case is a solid option for amateur users simply requiring a safe and secure means to transport their quadcopters in their own vehicles. Professionals might need something a bit harder to cope with the variables of air travel and other forms of public transportation. Similar to the Depstech Potensic offering, the Bangcool Protective Carrying Case Hard Travel Box for DJI Phantom 3 is a fantastic option for those buying on a budget. Made from heavy-duty aluminum, the case also features reinforced corners for added protection against falls and other forms of hard impact. The case is weather-resistant but makes no promises in terms of waterproofing or dust-proofing, so avoid setting up in conditions where the equipment will be exposed to the elements for long periods of time. Measuring 21.5 x 9.3 x 14 inches, it is a relatively compact case that nevertheless offers some excellent storage features. 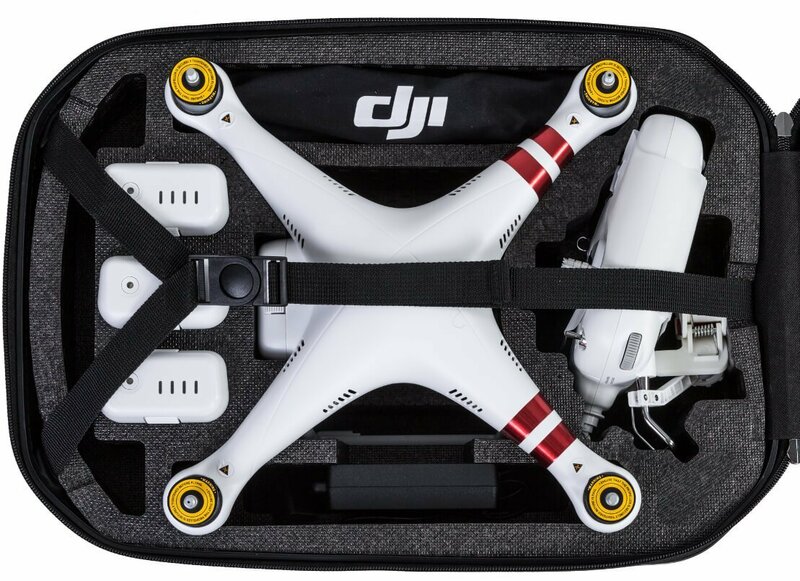 Not only will the Bangcool DJI Phantom 3 case safely and securely house your quadcopter, controller, charger, spare batteries and propellers in its pre-cut foam moldings, but there is also the option of storing your drone with the prop guard attached. 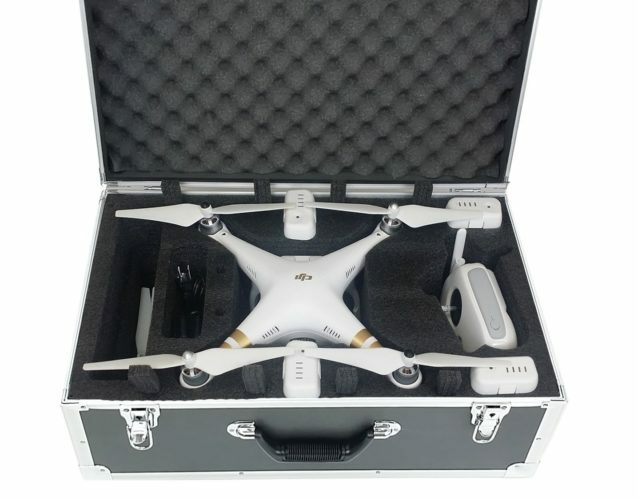 This feature is rarely found in cases costing far more than Bangcool’s DJI Phantom 3 case, making it an attractive option for first-time buyers who are simply looking for a reliable means of transporting their drone to nearby outdoor locations. Those who intend on traveling extensively with their quadcopters – perhaps by air or rail – might need to invest in a more robust option (such as the Nanuk 945) in order to guarantee the safe passage of their equipment.